Monday through Friday, 1:00-5:00pm. Or call for an appointment! To make a donation to the San Francisco FSP branch, click the button below! 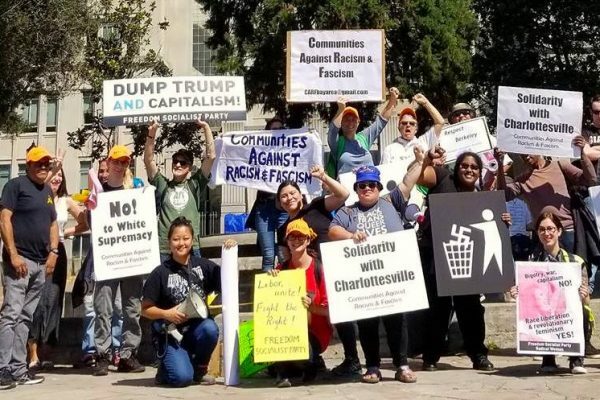 Join up with workers who are organizing against racism and sexism in hiring and on the job, unsafe worksites, and the abuse of at-will employees. Meet and support San Francisco city workers, teachers, and other Bay Area public and private sector employees, who are fighting to improve their working conditions. Protest the City’s anti-worker and pro-privatization agenda that is fueling the direct gentrification in our communities. Share your experience and ideas on how to fight back against bigoted bosses, impunity, harassment, and abusive negligent management. Stand up against hostile and unsafe workplaces which can affect everything from the ability to provide vital services to the quality of the water we drink. 5:00 to 6:30 pm — Rally & Speak Out at Civic Center Plaza (across from City Hall). • Accountability and an end to racist, sexist, homophobic, transphobic, hiring practices! • End the mistreatment of workers; unsafe working conditions, and at-will (temporary status) employment, which is being used discriminatorily and exploitatively, especially against women, people of color, and immigrants! • Keep our public utilities and services public! More permanent civil service positions and quotas for how they are filled! • Stop privatization of public resources and jobs! Want to endorse, volunteer, or donate to the event? Brenda Barros, SF General Hospital chapter president, member of Erase Racism; Raina Johnson, Museum Civil Service Chapter; Harold Powell, San Francisco Industry Chair; Alyssa Jones-Garner, Laguna Honda Chapter & SF Labor Council Delegate; Nicole Christian; Vicki McGuire, Human Services Agency; Bonnie Carlson, HSA-SFDAAS, Rafael Picazo, SFUSD Chapter President.